What is your favorite classic children's book? One that I loved growing up involved a little teddy bear and a missing button. 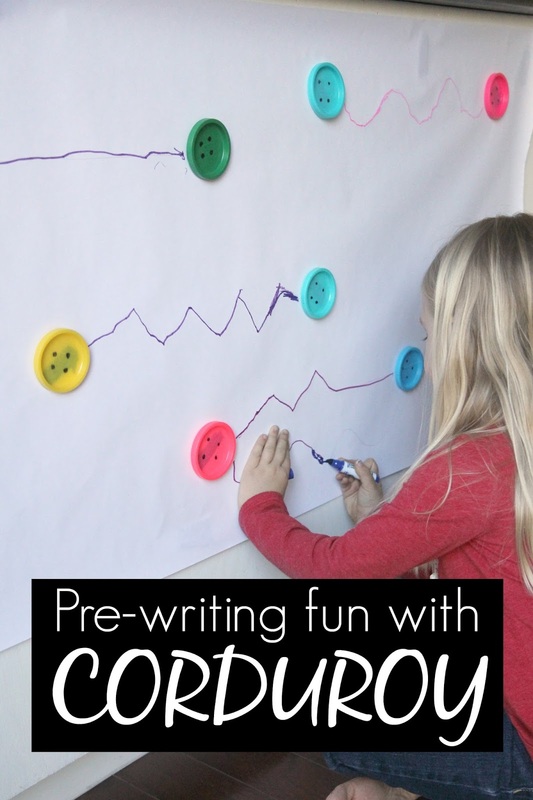 This month for Virtual Book Club for Kids we are featuring the book (affiliate link) Corduroy by Don Freeman and we're sharing some simple book inspired activities. Since my kids always love the part in Corduroy when his overalls get a new button, we decided to make our own buttons for a playful pre-writing activity. To make simple buttons we took large play dough lids and turned them to big buttons to help us with this easy pre-writing activity for preschoolers. To prepare for this activity first we put a large piece of white paper on the walls with painter's tape. Next we stuck some large "buttons" on the paper about 12-20 inches away from one another. After that we lightly drew penciled lines from one button to the next. Some lines were squiggly, some were straight, and some were even zig zagged! After the lines were drawn, we were ready to get started with this simple pre-writing activity! Kids will love drawing lines to hunt for the nearby button, just like Corduroy hunted for his button in the book! Once the activity was ready, kids grabbed markers and began drawing from one button to the next. I encouraged them to draw right into the button to make sure they hit it! I loved watching as they carefully traced over the lines to connect the buttons. Connecting the buttons by tracing over pencil lines (or drawing their own) is a great way for kids to practice drawing lines. Drawing different types of lines is a simple pre-writing activity that can help prepare kids for writing more complex alphabet letter lines or numbers. 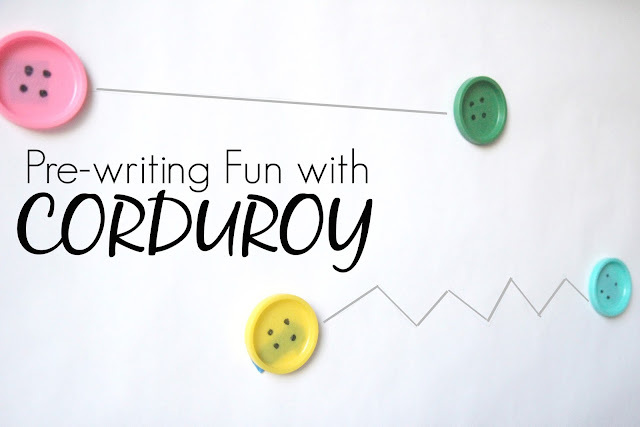 If you loved Corduroy and would like to find some additional book inspired activities, check out more ideas below from my Virtual Book Club for Kids co-hosts. Do you have any other favorite button themed or Corduroy themed activities? I'd love to check them out! You find so many brilliant uses for play dough lids! I love it! I love this activity. We love to work big and on a vertical surface so this will be perfect. I love this idea! Using the lids is so smart! Button lids, love it! Love how you made this a a big scale fine motor fun. Can't wait to try with my daughter.